With the end of the world rapidly approaching (if you believe those who make a living misinterpreting an ancient civilization), it seems everyone is looking for a quick way to find enlightenment. You can either go the longish route and spend hours a day meditating on the importance of nothingness, or you can fast-track your enlightenment and get a good laugh in the process. Enlightenment for Nitwits by Shepherd Hoodwin definitely supports the fast-track while laughing route. Lots of laughing. 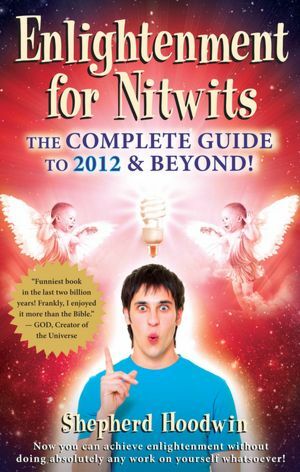 Enlightenment for Nitwits is a hilarious book full off short quips and a few longer tales from the author’s own life and bizarre experiences. Hoodwin shares his path to enlightenment through tales such as “A Lesson on Impatience” and “My Toilet Runneth Over.” The chapters are pretty much random thoughts brought together by some common element, and somehow it all works perfectly. I read Enlightenment for Nitwits in the dentist’s office while waiting for my son, in line at the post office, and pretty much everywhere else that I needed a quick laugh. His tales are reminiscent of the late, great Mitch Hedberg : quirky, a little random sometimes, but utterly hilarious. I literally laughed out loud in quite a few parts, and I’m not typically an LOL type of girl. The message of enlightenment is definitely there, if you know how to look for it. Buried in each hilarious quip is a deeper message. Basically, my take on the whole enlightenment thing is that if you lighten up, it will come. Unfortunately, according to Hoodwin’s writings, it seems that while getting enlightenment to come to you is possible, getting Brad Pitt to do the same isn’t exactly as easy. I should note that this is a book for someone with a very open mind. If you’re easily offended, you may not enjoy this book. Hoodwin does “bleep” out the bad words, often comically, but he does talk a bit about sexual relationships and doesn’t hold back when it comes to religions. He doesn’t say anything bad about anyone, per se, but he certainly doesn’t censor his thoughts. Buy it on Amazon in ebook version for $9.95 and print version for $14.95, or on Barnes & Noble. 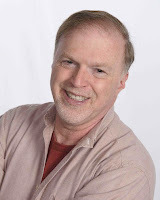 Shepherd Hoodwin is the author of popular books such as Loving from Your Soul: Creating Powerful Relationships and Meditations for Self-Discovery: Guided Journeys for Exploring Your Inner Self. He has been channeling since 1986. He also does intuitive readings, mediumship, past-life regression, healing, counseling, and channeling coaching (teaching others to channel). He has conducted workshops on the Michael teachings throughout the United States. Shepherd is a graduate of the University of Oregon in Music. He lives in Laguna Niguel, California, with his significant other, Leroy, who happens to be a plant. Can just imagine everyone’s face while your in the dentist and post office just bursting out laughing ! !